Rev. Ezra Palmer was born October 15, 1833, in Michigan, but lived in Illinois from age 16 on. He became a United Brethren minister in 1859 and spent 30 years in the ministry. He deserves much credit for the development of what became Rock River Conference. Ezra was first assigned to the Van Orin circuit in northern Illinois. Since he didn’t own a horse, he walked from one meeting place to another, preaching three times each Sunday, with a 15-mile walk between two of the charges. He would show up–perhaps tired, but never late–after having weathered heat, mud, snow, rain, or whatever else was required. In 1863, Ezra married Elizabeth Carter, from Iowa. They struggled financially, especially after Ezra seriously injured his back while working in fields to bring in a little extra income. One time Elizabeth borrowed some bread to make toast for her husband, and went without food for herself. She then found a place of solitude where, on her knees, she poured out her heart to God. As she prayed, a person from the church came by with food. But in addition to food, they needed money. So Elizabeth kept praying. The next day an elderly woman came by. “I have two dollars, and want to give you one.” In that way, God provided both food and money. 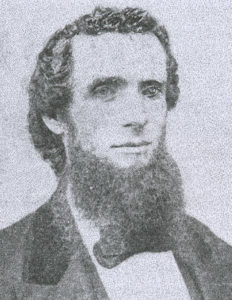 Ezra Palmer passed away in 1885. Elizabeth survived until 1922.